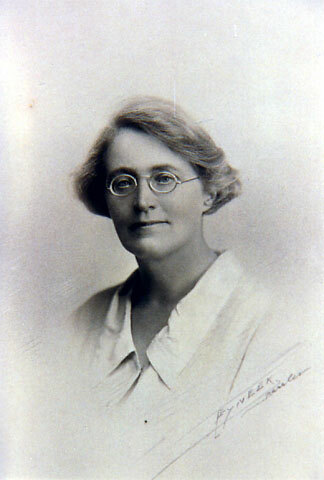 Grace Crowfoot in 1926. Studio Portrait. Courtesy Crowfoot Family. 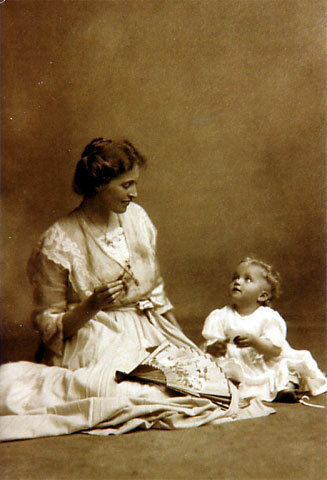 Crowfoot as young mother with child Dorothy, 1911. Courtesy Crowfoot Family. 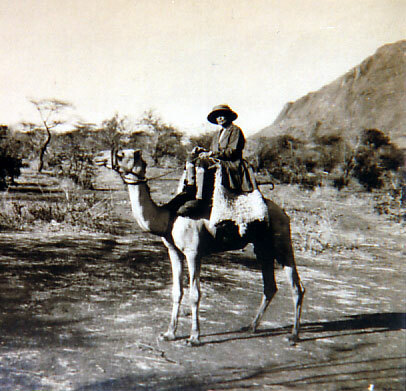 Grace Crowfoot on a camel in Nubia, 1917. Courtesy Crowfoot Family. Grace Crowfoot teaching her daughter E. Crowfoot to weave, 1921. Courtesy Crowfoot Family. Grace Mary Hood, “Molly “ to her family and friends was born in 1877 in Lincolnshire England, the oldest of six children. Her grandfather collected Egyptian antiquities, which at his death were sold at Sotheby’s, but it put her in contact with archaeologists, like William Flinders Petrie. Molly went to finishing school in Paris and was to attend Lady Margaret Hall at Oxford, but her mother discouraged it. Wintering in San Remo, she took part in botanical expeditions in the Ligurian Alps and excavated the cave at Tana Bertrand in 1908-1909 where among other things she found 300 beads that she published. She became interested in Christian Socialism and women’s rights as well as spinning and weaving and she became a professional midwife. She married John Winter Crowfoot in 1909, the Assistant Director of Education in the Sudan, and the next years were spent in Cairo where they had three daughters, and she learned photography and published a work on desert flowers. 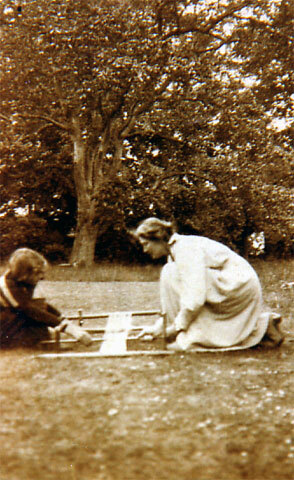 After The First World War interceded, John and Molly moved to the Sudan where she became expert on spinning, published and began to study the paintings of spinning and weaving from Pharaonic tombs. The birth of their fourth daughter and the end of the war brought them back to England. With the death of all her brothers from wartime activity she became a member of the League of Nations Union. She published several books on looms and textiles and tablet weaving, and the reproductions of many Egyptian finds for Petrie as well as European weavings. She also continued to publish botanical works. When John became Director of the British School of Archaeology in Jerusalem and was put in charge of several excavations, Molly organized the excavation headquarters and worked in the field, and saw the excavation reports through to publication. She also continued her interests in botany and textiles and published several additional papers, including impressions on the bases of pottery from the Chalcolithic period at Jericho. With the advent of World War II she returned to England and worked on the Sutton Hoo Ship burial and after the war published a joint paper on the embroidered panels of Tutankhamun’s tomb. With the recovery of the Dead Sea Scrolls she published a paper on the Qumran textiles. Among other things, she had trained a generation of textile archaeologists before she died from leukemia in 1957. Keywords: Alban, Agden, Agnes Geijer, Alps, Alsace. Antonio Bianchi, Anglo-Catholic, Annie McCall, antiquarian, archaeologists, Arctic, Artas, Balalucco, beads, botanical expeditions, botany, British School of Archaeology in Jerusalem, Arisaig, Asia Minor, Astley, Audrey Henshall, Bankfield Museum, basketry, Beccles, Beduin, Bishop of Lincoln, British Academy, Burton, Cairo, Canadian Artic, Certificate of the College of Midwives, Chalcolithic, Charles Singer, Charles Stuart, Christian Socialism, Christobel (Kit) Hoare, Church, Coptic, Crowfoot, Clapham Maternity Hospital, Colonel John Hood, Colonel Momber, Dardanelles, Dead Sea Scrolls, Denmark, Dorothy (Dolly), Diana, Dorothy Mary, Durham Cathedral, Edward, Egypt Exploration Society, Egyptian antiquities, Egyptian Department at the Ashmolean Museum Oxford, E. L. Sukenik, Elizabeth Grace, Ethel Mairet, England, European, Flowering Plants of the Northern and Central Sudan, Frankland, French, From Cedar to Hyssop, Gallipoli, Garstang, Geldeston, Genoa, Gerald Lankester Harding, Gerasa (Jerash), Girdle of Ramesses III, Gordon College, Grace Mary Hood, Graham W. Rowley, Greece, Guy Brunton, Halifax, Harvard, Heidelberg, Henry Ling Roth, Hilda Petrie, History of Technology, Howard Carter, India, Issel, Ivo, Jericho, Joan, John Winter Crowfoot, Jordan, Journal of Egyptian Archaeology, Joyce Winter Griffiths, Kate Stevens, Kathleen Kenyon, Kew, Khartum, Khety, Kings I, Lady Dufferin, Lady Margaret Hall at Oxford, Lake Huleh, League of Nations Union, leukemia, Ligurian Alps, Lincoln, Lincoln Cathedral, Lincolnshire, Liverpool, Llewellyn Griffiths, Margrethe Hald, Margrethe Lehmann-Filhés, Marion Ritchie, midwife, London, London School of Medicine for Women, ‘magyar’-cut, Martin, Mediterranean, Meroe, Methods of hand-spinning in Egypt and the Sudan, Middle East, Molly, Momber, ‘muckle wheel’, Monaco, music, N. de G. Davies, Nettleham Hall, Nobel Prize, Norfolk, Ophel, Oxford, u, papyrus, Paris, Peter Collingwood, Pharaonic tombs, photography, ‘Primitive Looms’, Qau-el-Kebir, Qumran, radiocarbon, Red Sea, rheumatism, rod heddles, Royal Botanical Gardens, Rudolf Pfister, Russian, Samaria-Sebaste, Samaria-Sebaste II: Early Ivories, San Remo, Schweich Lectures, Scottish, Shaen, Sherif Yusef, Sicily, Sinclair, Sitt Zeinab, Socialism, Some Desert Flowers, Somerville College, Somme, Sotheby’s, spinning, St. Cuthbert, Strode, Sweden, Sudan, Suffolk, Sussex, Sutton Hoo Ship burial, Tana Bertrand, Techniques of Tablet-weaving, Thirsk, TransJordan, tuberculosis, Tutankhamun’s tomb, weaving, William Flinders Petrie, women’s rights, Victoria and Albert Museum, Wadi Muraba’at, Winlock, World War II, Worthing, Yale, Yorkshire.